Brett Noble and Lyons MHR Eric Hutchinson. 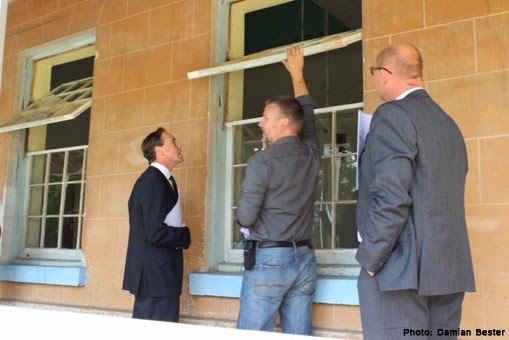 FUNDING options for ongoing restoration works at Willow Court were suggested by the Federal Minister for the Environment, Greg Hunt, during a short visit to the site yesterday morning. Mr Hunt's ministerial portfolio includes responsibility for heritage and he spent about 45 minutes looking over the recent works at the Barracks and Bronte House, as well as discussing urgent conservation and restoration works needed at the nearby Frescati House. The minister commented on the great progress made since his first visit to the site during last year's Federal Election campaign, in particular at the Barracks where 180-year-old windows have been restored to the original operating conditions and several rooms have been made ready for multiple future uses. grapevine in the garden at Frescati House. 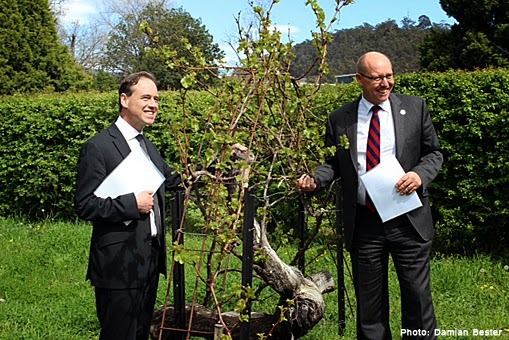 Brought to New Norfolk by his Liberal Party colleague and Federal Member for Lyons, Eric Hutchinson, Mr Hunt suggested a three-pronged approach including having the site added to the new National Heritage List, developing projects for the recently established Green Army and making an application for funds under the second stage of the Stronger Regions Fund early next year. Long recognised by the National Trust, the entire Willow Court site did have national heritage listing on the Register of the National Estate while an earlier listing specifically for the Barracks building was registered in 1978. That register was closed in 2007 and is no longer a statutory list. The Willow Court complex is permanently listed on the Tasmanian Heritage Register.